Professor David Austin, Associate Dean-International, Deakin University| Professor Jane den Hollander AO, Vice-Chancellor & President, Deakin University| Professor V. Mohan, President, MDRF |Professor S.P. Thyagarajan, Professor of Eminence and Dean (Research), SRM University, Chennai| Professor Julie Owens, Deputy Vice-Chancellor (Research). Bangalore: Madras Diabetes Research Foundation (MDRF) and Deakin University, Australia recently organized a day-long workshop on diabetes to explore opportunities of research and highlight the critical areas where urgent progress is required. 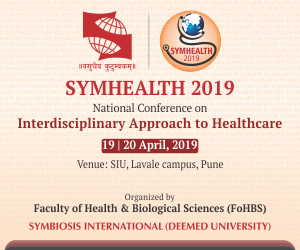 Aptly titled “Diabetes Research – A Fertile Field with Numerous Opportunities” the workshop was also a celebration of 25 years of Deakin University’s engagement in India. 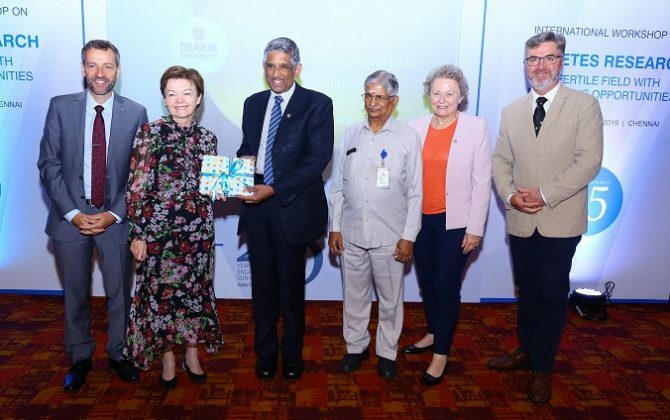 Ms Susan Grace, Australian Consul-General, Chennai; Professor Jane den Hollander AO, Vice-Chancellor & President, Deakin University; Professor David Austin, Associate Dean-International, Deakin University, Professor V. Mohan, President, MDRF and Professor S.P. Thyagarajan, Professor of Eminence & Dean (Research), SRM University, Chennai inaugurated the session. Commemorating 25 years of engagement with Deakin University, Australia and India (1994 to 2019), Deakin University, Australia is hosting a range of events in collaboration with The Australian Trade and Investment Commission and its India partners to explore future engagements in areas of strategic importance to India and Australia. As part of this initiative, Dr Mohan’s Diabetes Specialties Centre’s research wing Madras Diabetes Research Foundation (MDRF) and Deakin University, Australia organized a day-long workshop to further research initiatives in diabetic treatment and care. Participating at the event were eminent faculty from Deakin University, Australia including Professor Jane den Hollander AO, Vice-Chancellor & President, Deakin University, Professor Julie Owens, Deputy Vice-Chancellor (Research), Professor Anna Peeters, Director, Institute for Health Transformation, Professor. Jon Watson, Dean, School of Medicine, Professor Jo Williams, Associate Head of School (Research), Dr. Kathryn Aston-Mourney, Senior Lecturer in Human Biology, School of Medicine, Dr. Virginia Hagger, Lecturer in Nursing, School of Nursing and Professor Ken Walder, Chair in Metabolic Diseases.